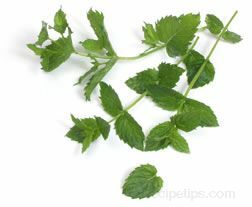 An herb that is a variety of mint that has long, hairy green leaves containing oil that is used in flavoring candy and toiletries. Carvone is the compound produced from leaves through steam distillation that becomes the flavoring derived from spearmint. It is one of the most popular mints for cooking and is used in both sweet and savory dishes. Spearmint is grown world-wide and is available in many markets throughout the year. When selecting, choose leaves that do not show signs of wilting and are evenly colored. Store stems down in a glass of water with a plastic bag covering the leaves. Place in the refrigerator and store for up to a week, changing water every couple of days.